I am currently reading The Martian, the Exciting scienc-fiction novel by Andy Wier. It takes place during the 2030s, and features the crew of a manned mission to Mars aboard the spaceship Ares III, who establish a temporary artificial habitat, called the Hab, on Mars, where they intend to stay for two months before departing back to Earth. However Eighteen days into the Mars mission, a massive Martian storm hits the base and the crew is forced to abandon the planet due to the danger that their escape vehicle will be destroyed and leave them permanently stranded on Mars. Unfortunately While evacuating, astronaut Mark Watney is lost and presumed dead as his biomonitor is damaged. With the lives of her crew at stake, mission commander Melissa Lewis is forced to leave the planet, leaving Watney behind. Back on Mars Watney survives the storm and makes it back to the Hab. Unable to contact NASA and Faces a fight for survival on Mars until he can be rescued. However Being a resourceful fellow, Watney uses his knowledge as a Botanist to construct a makeshift farm and Habitat for himself which will allow him to grow crops that will sustain him until he can be rescued by The next Mission to Mars “Ares IV”. Watney also locates the Pathfinder probe, defunct since 1997, and uses it to regain contact with Earth and also modifies the Mars Rover in order to send and receive text messages from NASA under guidance from NASA director Teddy Sanders. Russian-American author and professor of biochemistry at Boston University, Isaac Asimov, was. born January 2, 1920, he is best known for his works of science fiction and for his popular science books. Isaac Asimov was one of the most prolific writers of all time, having written or edited more than 500 books and an estimated 90,000 letters and postcards. His works have been published in all ten major categories of the Dewey Decimal System (although his only work in the 100s—which covers philosophy and psychology—was a foreword for The Humanist Way). Asimov is widely considered a master of hard science fiction and, along with Robert A. Heinlein and Arthur C. Clarke, he was considered one of the “Big Three” science fiction writers during his lifetime. 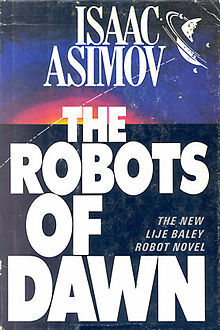 Asimov’s most famous work is the Foundation Series; his other major series are the Galactic Empire series and the Robot series. The Galactic Empire novels are explicitly set in earlier history of the same fictional universe as the Foundation Series. Later, beginning with Foundation’s Edge, he linked this distant future to the Robot and Spacer stories, creating a unified “future history” for his stories much like those pioneered by Robert A. Heinlein and previously produced by Cordwainer Smith and Poul Anderson. He wrote many short stories, among them “Nightfall”, which in 1964 was voted by the Science Fiction Writers of America the best short science fiction story of all time. Asimov wrote the Lucky Starr series of juvenile science-fiction novels using the pen name Paul French. Asimov also wrote mysteries and fantasy, as well as non-fiction. Most of his popular science books explain scientific concepts in a historical way, going as far back as possible to a time when the science in question was at its simplest stage. He often provides nationalities, birth dates, and death dates for the scientists he mentions, as well as etymologies and pronunciation guides for technical terms. Examples include Guide to Science, the three volume set Understanding Physics, Asimov’s Chronology of Science and Discovery, as well as works on astronomy, mathematics, the Bible, William Shakespeare’s writing and chemistry. Asimov was a long-time member and Vice President of Mensa International, albeit reluctantly; he described some members of that organization as “brain-proud and aggressive about their IQs.” He took more joy in being president of the American Humanist Association. The asteroid 5020 Asimov, a crater on the planet Mars,a Brooklyn, New York elementary school, and one Isaac Asimov literary award are named in his honour.